Something of a rarity, but what is it? Not a true 'wotzit' as both car and engine have been identified, but we thought we would give you all a chance for a bit of 'detective work'. Car and motor both originate from the same country and the body and pan shape are quite distinctive. 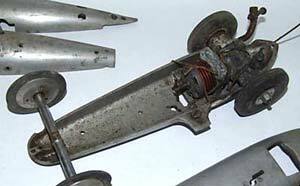 The plain wheel discs are also relatively unusual, with the securing screws going through the inner side of the wheel, which made it easy to confirm which factory the car originated from. The motor should be no problem for Eric? The current owner is a lifelong motor sport enthusiast and racer and is closely involved in the Bonneville speed events. 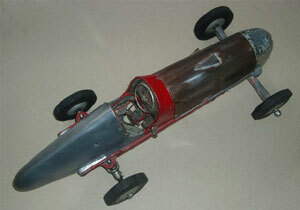 As a science project at school, he built a pulse jet powered, LSR car, based on Nathan Ostich's full sized jet version. Somewhat surprisingly, both car and engine are Japanese. The car is a very rare Yano and the motor a late model 10cc Mamiya. They were purchased by an American serviceman stationed in the Philippines during the late 40s and then taken back to the US when he returned. Luckily, and seemingly uniquely, M&E Models gave each chassis a serial number (starting from 1000) and bodies (starting at 0). This gives a fairly accurate idea of production and identifies each car on its journey through various hands. This excellent example of a 'Special' is chassis# 1351 and body # 133. No they never seem to match. It has gained a pair of 1066 front wheels at some stage in its life and the tether brackets are not original, but other than this, is a very nice, genuine car. It also shows that it is worth looking beyond the obvious on eBay? 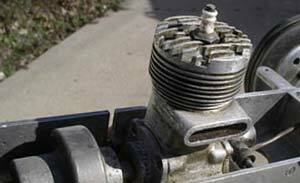 The motor is unusual for a car and something of a rarity, being a Keil Kraft 6cc. 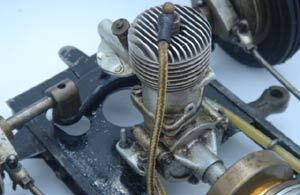 This is one of a number of similar sized spark ignition motors produced in the UK around 1946/47 and this one was marketed by Eddie Keil under the Keil Kraft name. What is not known is who designed or manufactured the engine. Like most other similar engines, the arrival of the glow plug and development of the small diesel killed this sector of the market, and this engine has obviously been converted to glow, somewhere along the way. Gary Maslin unearths another 'mystery' gem. This car could have been frightening with a 10cc Nordec racing engine coupled directly to one driving wheel. 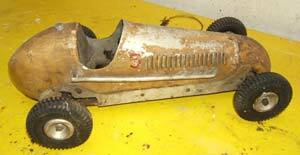 The car, along with other tasty items, was discovered in a loft in Whittington, near Chesterfield. The assumption is that Mr Fleming who had previously owned the house had built the car in the late 40s and probably abandoned the whole thing as being unworkable. 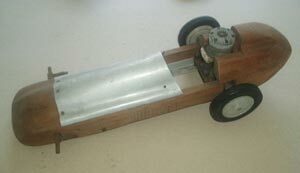 The wooden body is over 20" long with the engine mounted across the chassis in a metal sub frame. 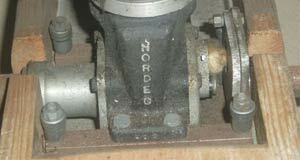 Accommodating the second axle and venturi of the rear induction Nordec looked like a challenge too far for the builder. Other than the motor and the tyres, everything else has been built from scratch and if ever completed would probably be best as a display item and conversation piece. Transmitting that amount of power through one narrow 4" tyre would have been adventurous to say the least. A functional Bottoms Up and a not so functional Bomb? Take two Oliver Tiger 2.5 Proto pans, bolt them together and the most successful of the Oliver types, the 'Bottoms Up' was created. Although intended for the Tiger twinshaft, other motors found their way into the cars, such as the converted ED Racer seen in this example. 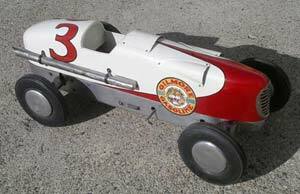 Around 1952 Oliver produced the minimalist Tiger Bomb. 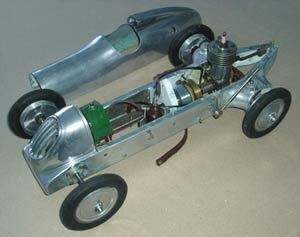 As the name suggests it was a perfectly streamlined shape, just large enough for a twinshaft motor a tank and cutoff. 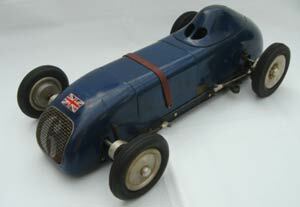 Run sharp end or blunt end first, this was the most expensive of the racing cars at just under £15. The remains shown here also have a converted ED motor. 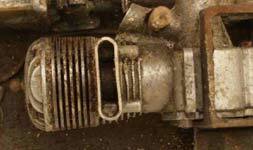 Both should be restored to running condition relatively quickly. The phone description and pictures of this car pointed to it being a Dooling Mercury, but further photos enabled Peter Hill to correctly identify it as a FRC car built in Swindon and marketed in kit form during the late 40s. Not only did this make it very rare indeed as only one other is known to exist, but it would seem to be the original prototype with the very much more pleasing ‘Brooklands’ type body that was abandoned for the production versions. Once considered to be the 'rarest of the rare' of the British commercial cars, around 10 E&Ms have come to light recently. 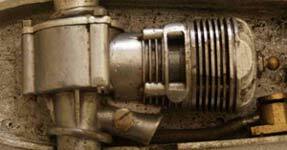 With the exception of the Stentor engine, everything else was produced specifically for this model, the only one produced by E&M. The car shown was bought complete around 1988, run regularly at Old Warden until 1995 and changed hands on ebay in 2008 for £1500. Removing the lid has revealed a 1066 clutch and a non standard gearbox, but otherwise the layout is correct, even to the 'knock off' arm. This delightful home built car was discovered in a garage in the Midlands. It was built by Ray's dad, a lecturer at the Lucas apprentice school and features a 5cc 1066 Falcon motor machined from a kit of parts. The body is a very well proportioned semi-scale interpretation and carries the dummy chassis rails and exhaust pipe. A deal of care has gone into cutting the many louvres in the bonnet area. The car is in genuine 'barn find' condition even down to the frayed electrical cable that once served as a set of bridles. It is not known if the car ever ran on a track, but it certainly did grievous damage to the front lawn on many occasions.